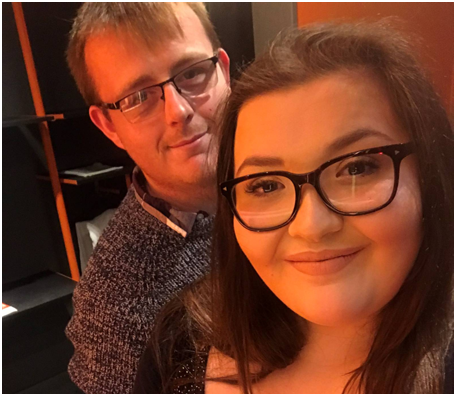 Zoe and Nathan attended a Preparing Together day in September 2018 and were very happy to share their experience with us. Nathan and I met through mutual friends. We exchanged numbers and met up on several dates before becoming boyfriend and girlfriend. We both say we stumbled upon each other in a time of our lives where we did not expect to meet someone so important and special. When did you get engaged and how did he pop the question? We got engaged on the 20th April 2016. He popped the question on our holiday to Majorca. We were walking along the beach listening to a guitarist playing love songs when he got down on one knee and asked me. This was very romantic but also quite entertaining as a wave washed in and soaked Nathan’s jeans and trainers. He certainly was not very impressed but we laugh about it even now it makes it more memorable. How did you come to know about our Preparing Together course? We met with several priests whilst making preparations for the wedding and one priest mentioned that we should attend. I felt nervous as I did not know what to expect from the day or what the facilitators/other attendees were going to expect from us. I was also nervous that we were going to be put on the spot or asked lots of questions that we may not have the answers to. Nathan said that he felt slightly apprehensive that the facilitators/the day was going to be preaching about the Catholic faith and less about actual marriage. How did you feel once you were at the Preparing Together course and what were the facilitators like? I felt much more comfortable as we had a plan of what was going on and were told that it was informal and that we could share as much or as little as we would like. Our facilitators on the day were absolutely brilliant, they made us feel at ease and that we could talk about anything. They guided us through the day promptly and delivered the PowerPoint and information in a way that was understandable to us. They took an interest in us and were able to relay back information we had discussed, they were highly attentive to our needs and we were never out of tea or coffee. What was the best tool/advice you got from the day? The best advice we got was about conflict resolution. So, now when one of us is getting upset we step back and ask why. Or we say things like ‘Nathan, I do not like it when you put your clothes next to the washing basket and not in it’. We are much more direct with each other now rather than letting silly things build up making us more frustrated, we talk about these things a lot more which is great. What was the highlight of the day for you both? Learning how our family/childhood traditions can impact on our future traditions as a couple and being able to talk through what we would like for our relationship and our family was inspiring. Nathan’s highlight of the day was reading our vows. He said it really put into perspective what we would be saying/reading on the day as he never knew before. How do you feel about your relationship and going into marriage now? I think we are both much more informed about marriage and what we mean to one another and what habits and experiences we bring to our relationship. I also think the course has brought us closer together. We still have our late nights talks to each other as discussed on the day but they seem to be more valuable in exploring how we could make our relationship flourish even more. What would you say to other couples thinking about attending the course? I would say attend the course and you will be amazed at what you could learn about each other. It really helps to talk to complete strangers about your love life and truly express your passion about yourselves as a couple. If you would like to book a place on a Preparing Together course please visit our online search and booking page. Click here to find out more about Preparing Together.